Researchers at the University of Illinois worked with physicians at Carle Foundation Hospital in a new study that found one measurement of biomarkers in the blood can predict a patient’s sepsis status as well as monitoring the patient for hours. 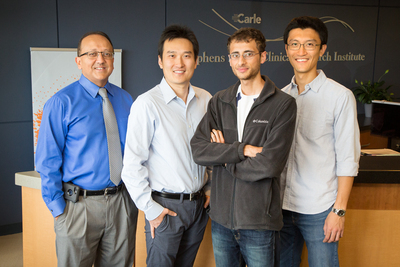 Pictured, from left: Professors Rashid Bashir and Ruoqing Zhu, Prenosis Inc. employee Ishan Taneja and professor Sihai Dave Zhao. CHAMPAIGN, Ill. — Sepsis is a deadly and quick-moving medical condition, but its presence can be betrayed early on by the very immune responses that trigger it. A team of researchers from the University of Illinois and Carle Foundation Hospital in Urbana, Illinois, found that five key biomarkers in blood that characterize sepsis can give physicians as much information as hours of monitoring symptoms. Sepsis develops when the immune system overreacts to an infection in the body. It triggers widespread inflammation that can very quickly lead to organ failure and even death. Currently, the standard for determining whether a patient has or is developing sepsis is to monitor their vital signs over time to watch for key symptoms. “Sepsis is one of the most deadly and costly conditions for hospitals in the United States, striking roughly 20 percent of patients admitted to intensive care units and accounting for more than 5 percent of health care costs nationwide,” said Rashid Bashir, the executive associate dean of the Carle Illinois College of Medicine and a professor of bioengineering at Illinois. Bashir co-led the study with Zhu. The Illinois group focused on an alternate means of quickly identifying patients in the early to peak phases of sepsis: measuring biomarkers in the blood that point to elevated immune responses. In July, the group published a study detailing a new point-of-care device for measuring biomarkers in a single drop of blood. The researchers also have a startup company, Prenosis Inc., that is working to commercialize the device. In a new study published in the journal Scientific Reports, the researchers identified five key sepsis biomarkers and looked at whether they had the same or better predictive power as traditional methods. “These biomarkers are the first things that get triggered in the progression of the disease, so it makes sense to look at them if you want to make a more accurate early diagnosis,” said Ishan Taneja, the first author of the study. He is a recent Illinois graduate now employed at Prenosis. To see whether the biomarkers could be used to identify patients in the early to peak phases of sepsis, the researchers used blood samples and vital sign data from electronic medical records from patients in the ICU and emergency room at Carle Foundation Hospital. The researchers used machine learning models to determine the predictive power of using traditional vital sign data, using biomarkers alone, or using a combination of the two. They found that combining biomarker data with electronic medical record data yielded the greatest predictive power. However, they also found that biomarkers alone carried more predictive power than data from electronic medical records alone – in fact, one biomarker measurement from a single blood draw yielded the same results as monitoring vital signs for an additional 16 hours, time that could be crucial for treatment. The Illinois researchers and Carle physicians plan to continue their partnership to further verify the usefulness of biomarkers for identifying sepsis, and to integrate all five of the biomarker readings into the point-of-care device. They also are looking to further track the progression of sepsis so that physicians can identify what stage of the disease a patient presents. “This paper focuses on making decisions from a single point, when a blood sample is taken. What we’re working on right now is to take multiple measurements to see if the trajectory of disease progression can be predicted accurately,” Zhu said. Carle Foundation Hospital and the department of statistics at the University of Illinois supported this work. Editor’s notes: To reach Rashid Bashir, call 217-333-1867; email rbashir@illinois.edu. To reach Ruoqing Zhu, call 217-265-7104; email rqzhu@illinois.edu. The paper “Combining biomarkers with EMR data to identify patients in different phases of sepsis” is available online. DOI:10.1038/s41598-017-09766-1.